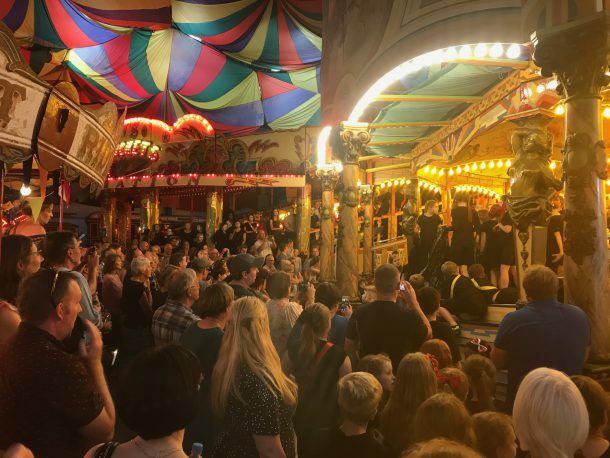 Over 100 students from across the community came together on Friday after months of rehearsal to perform their version of Macbeth in the vibrant and occasionally spooky surroundings of Dingles Heritage Fairground. This collaborative community project involved students from Launceston College, Bideford College, Egloskerry, St. Catherines, St. Stephens and South Petherwin, each of whom took a scene from the play, and the promenade performance retold the story in sections, using all Shakespeare’s original language. From the opening battle scene staged on the dodgems, to the murder of King Duncan on the ghost train to the closing finale on the waltzer, each school showed exceptional confidence in their delivery, and a deep understanding of the issues around the text, the story of the play, and the characters. A truly ambitious performance, with commendable energy, enthusiasm and commitment from all involved. A huge thanks to all the teachers involved, but especially to Jo Mason, Head of Drama, whose directorial vision made the event so distinctive. Look out for our Romeo and Juliet project next year!